Krishel introduces herself this way: "My name is Krishel Augustine, I am Navajo, and am 17 years old. I am the tangle clan born for the towering house people, my maternal grandparents are the Apache people and my paternal grandparents are the Zuni people. I am from Ramah, New Mexico. I have been singing since I was 13 years old. I started singing the National anthem at various events then I was inspired by my family to start composing my own songs. I wrote a song for the National Park Service called the "Junior Ranger", which went nation-wide to all the National Parks. I have a lot of respect for my culture. I come from a family that is very traditional and am very fortunate to have a strong culture that keeps me on the right path. 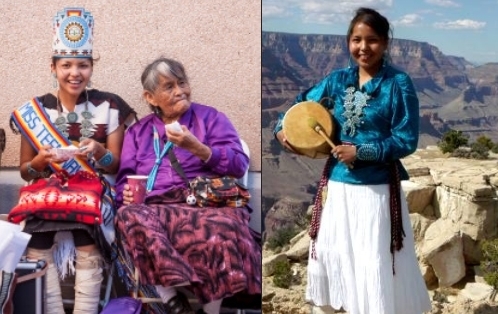 Ahee'hee"
Responses to "A 17-year-old Navajo Singer Sings To Honor Traditional Family Values"